The 2016 annual meeting of the Arts and Crafts Society of Central New York will take place on Sunday October 9, 2016 beginning at 11:30am in the Empire Room on the top floor of the restored Hotel Syracuse, now known as Marriott Syracuse Downtown, located at 500 S Warren Streeet, Syracuse, NY. The event will include tours of the restored hotel, a sit down luncheon, business meeting and a presentation by Dennis Connors, Curator of History at the Onondaga Historical Association, on historic hotels in Syracuse. Details to follow. 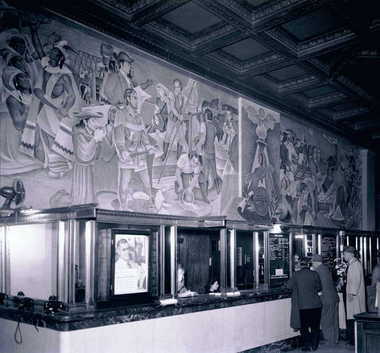 Reception Desk, Hotel Syracuse with a mural that until the recent restoration had been covered with mirrors (circa 1940). Photo courtesy of Onondaga Historical Association.